International military and political experts agree that Russia-U.S. and China-U.S. relations are becoming the key factors in international relations of the world today. What challenges does this new global strategic knot present? China has surpassed the United States in terms of both industrial production and export volume, and it is projected to catch up with the U.S. in GDP by 2016-2018 and in military spending by 2025. 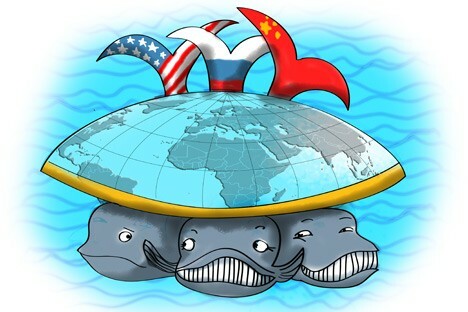 The United States has been trying to adapt to a polycentric world after its efforts to consolidate a unipolar world failed, but it stills finds itself overstretched. The United States is currently withdrawing troops from Iraq and preparing for a pullout from Afghanistan, all the while facing a huge budget deficit at home. According to estimates, the U.S. will have to borrow 30 cents on every dollar of public spending for the 2013 fiscal year, primarily from China. While economic issues have taken priority in negotiations between the two countries, Washington is increasingly concerned about Beijing’s military buildup. China is now capable of defending its own territory, but, more importantly, has also begun developing military capacity that will allow it to expand its “security perimeter” into the Pacific region. The United States released a new defense policy early this year, which introduced an important change to the country’s military strategy. For the first time, the policy has named China, along with Iran, as a potential enemy of America. “The Chinese military buildup is moving forward at a breakneck speed. The Chinese armed forces are rearming, and they are doing this without making any personnel or weapons cuts. The Chinese army had between 8,000 and 10,000 tanks 15-20 tears ago, and this number hasn’t changed. However, while in the 1990s those tanks were numerous variations on the T-55, currently between 30–40 percent of them are “Type 96” or “Type 99”machines – a totally new generation of armored military equipment. Older aircraft such as the J-8 are being replaced with the new J-11s,” Aleksandr Khramchikhin, deputy director of Moscow’s Institute for Political and Military Analysis, said. The June issue of the respected American aerospace weekly Aviation Week & Space Technology quoted high-ranking U.S. officials and intelligence community representatives as saying that, if a crisis occurred in relations with China, Beijing would be likely to strike first. Furthermore, if the conflict were short-lived, its outcome would be far from favorable for the United States. In a nutshell, the Americans are concerned that the Pentagon’s military command systems and national intelligence gathering and processing channels are 80 percent dependent on space components. In other words, without satellite support, high-tech modern weapons with “smart” bombs and high-precision cruise missiles are little more than a pile of scrap metal. American weapons and intelligence experts are confident that, in the event of a crisis, China would initiate cyber-attacks and employ anti-satellite weapons. According to the U.S. Department of Defense, the military and information strategy of the Chinese armed forces provides for the use of special cyber task groups capable of attacking an adversary’s computer networks. Combat computing is a compulsory subject in the Chinese military training. Following coalition success in saving Kuwait, Beijing hastily began developing an anti-satellite weapons program of its own – and its diversity is impressive. For instance, the Chinese Air Force, which is responsible for coordinating work across the entire spectrum of military space technology, is able to pro-actively support large-scale use of “conventional” satellites located in “hidden” orbits. Massive deployment of cheap mini-satellites as strike weapons is also planned. The Russian expert expressed moderate optimism with regard to Russian–American relations. “While not large, Russian–U.S. trade has all but returned to its pre-crisis level. So, I think that the ‘reset’ has been a success, even though it has run its course. At issue now is an agenda for Russian–American relations going forward. As a matter of fact, the current atmosphere of election campaigning is making it difficult to achieve any compromise solutions,” said Rogov. Nevertheless, Russia’s integration into modern global processes is reason to hope that its strategic relations with both the West and the East will remain stable. Andrei Kislyakov is Russia's respectful expert in military and space issues.